First Impressions is a book which works on several levels. It is about the personal journey made by Lisa Hooper, from career conservationist to wildlife artist and it is organised around the many different print media she uses. 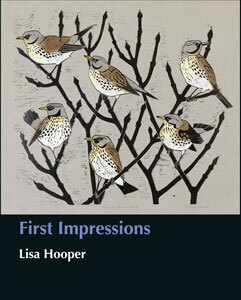 In describing her methods, Lisa provides basic technical details which help the reader to understand printmaking.Her striking and atmospheric prints are used throughout the book. Anyone can enjoy the book, artist or not: the images are superb. But going beyond that Lisa details the techniques employed and the tools and papers she uses, and there are many intermediate stages illustrated to show exactly how she does what she does. There are familiar linocuts and etchings, as well as Japanese woodblock printing, monotypes, collotypes, and hand coloured prints, producing everything from the most delicate to the boldest designs.